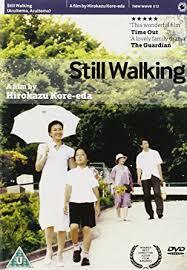 Our next screening is the charming STILL WALKING (2008) on Monday the 6th of August at Coast. From acclaimed director Hirokazu Kore-eda, who won the Palme d’Or this year for his upcoming film SHOPLIFTERS, STILL WALKING is a masterful small scale family drama. It’s a portrait of a family over a few days, as they commemorate the death of the eldest son. All told through nostalgia, humour, sadness and tension, as their memories are shared and ceremonies are performed. Kore-eda uses dialogue in such an honest and naturalistic way, that makes it universal in it’s storytelling, and often a reflection of our everyday lives. He is also one of the finest directors of children working today, and this film is another fine example of that talent. In his 4 out of 4 review of the film, Roger Ebert said of Kore-eda that "None of his films elevate the temperature with melodrama. They draw us inward with concern. Kore-Eda is a tender humanist, and that fits well with his elegant visual style”. It's measured filmmaking that creeps up on you and takes your breath away, and with Kore-eda’s latest film SHOPLIFTERS winning the top prize at Cannes, here’s hoping his films get seen by a wider audience. Doors open at 7.30pm, film starts at 8pm. The film is free to Worthing Film Club members (£25 a year - email Caroline at worthingfilmclub@gmail.com to join) or £4 for a ticket, which will be available on the door at Coast. for more details on membership, see here.